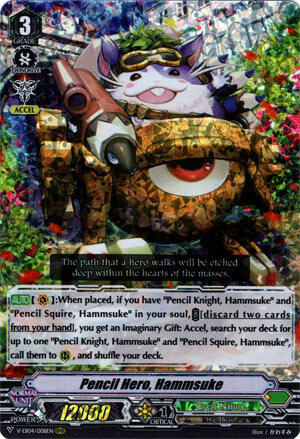 [AUTO](VC):When placed, if you have “Pencil Knight, Hammsuke” and “Pencil Squire, Hammsuke” in your soul, COST [discard two cards from your hand], you get an Imaginary Gift: Accel, search your deck for up to one “Pencil Knight, Hammsuke” and “Pencil Squire, Hammsuke”, call them to (RC), and shuffle your deck. I was iffy on this until I saw the lower Grade Hammsukes can search themselves. As it was though, the response I got from watching him was sort of lukewarm. Certainly on paper he sounds bad. But, opening with the right cards in the hand, after crunching some numbers through Hypergeometric Distribution, isn’t as ridiculous hard as it sounds, but all the same, the Extra Accel Circle, particularly for a deck that seems to encourage multiple rides, mostly Leo-pald renders this sort of winmore. I don’t believe you need that many Accel circles to hit all that hard since Great Nature doesn’t seem to be starving for stupid amounts of hard advantage. You could probably run Armed Instructor Bison at some amount if you want, because I don’t believe that without more support this is worth counting on in a game. He also doesn’t do much else if you fail the chain. Or after you succeed in one.